NRHM Assam Staff Nurse Recruitment advt by the National Rural Health Mission. Check out the NRHM Staff Nurse Advertisement date is on 28th November 2018. So, keep notice for the NRHM Staff Nurse Notification through the nrhmassam.in recruitment official page. Go through the NRHM Staff Nurse vacancies under the Assam State and attend the walk-in interview on 01.12.2018. The NRHM Assam Staff Nurse Recruitment Notification invites for the Staff Nurses, Specialist Vacancies. So, who are eligible & willing candidates can apply for the vacancy. In this article, candidates can avail the entire details regarding the job notifications and also the vacancy detail clearly. So, participate without having any doubt. Who want to willing to work in the exalted NRHM Assam as a Staff Nurses, Specialist should analysis the complete details of NHM Staff Nurse Vacancy 2018 Or you can search on recruitmentIndia.In and get the walk-in interview date is 01.12.2018. In order to apply for the NRHM Assam Staff Nurse Notification 2018, contenders have to know the complete information. National Rural Health Mission shortly named as (NRHM). For this recruitment process, we uploaded the maximum specifics. So, the advertisement date is 28the nov 2018. The Registered candidates in the online exam have to appear for the Interview. 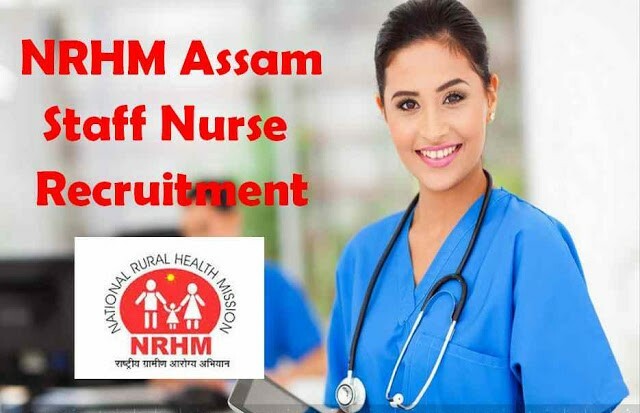 Those who are interested in applying the Staff Nurses, Specialist Vacancies Or you may find the NRHM Assam Staff Nurse Application form links to check the required info from this page. In the middle of the time candidates can also get the Exam syllabus. The complete qualifications for NRHM Assam Staff Nurse Recruitment notification as per the job wise. For Staff nurse: To apply for the NRHM Assam Staff Nurse Recruitment Candidates completed the B. Sc. Nursing & GNM Course passed from any nursing school/institution recognized by Indian Nursing Council and Should be registered with “Assam Nurses’ Midwives’ & Health Visitors’ Council”. Candidates who are already working under NHM, Assam shall not apply. For Specialist Psychiatry: 62 years. Selected candidates will get the Rs.16,500/- per month. (under revision). Candidates can also check the official NRHM Assam Staff Nurse Recruitment notification for more details about the salary. There is no payment for the NHM Assam Vacancy 2018. As per the records, contenders can check the NHRM Specialist Vacancy 2018 and then attend the interview on 01.12.2018. If you have any query regarding the NHRM Staff Nurse recruitment notifications check the official notifications before you applying the NHRM Specialist Vacancies. Almost, Who Apply Online NHRM Staff Nurses, Specialist they can get the notifications from the officials. They will be called for the candidates who are registered for the post, they will not get the any admit card for the Interview. So, get the alerts from the official link. So, applicants can check the NHM Assam Staff Nurse Notification and then attend the interview by having the necessary documents those details are given in the notification clearly.